Kids and trains go hand in hand. Ok, let’s face it – parents and trains go hand in hand, too. There is just something so captivating about spending a day riding the rails. And when it comes to train excursions, there are plenty to choose from right here in our little corner of the Midwest. This 19-mile scenic railroad dates back to 1867, making it a true piece of Indiana history. The railroad, which is part of an operating rail museum, offers regularly scheduled excursions throughout the year. Select days in June, young train enthusiasts can take a ride with Thomas and meet Sir Topham Hat during a “Day Out With Thomas.” On the “American Limited,” with dates in June, July and August, passengers are transported back to a Civil War battle, with a layover in historic Metamora as well. See their website for a full list of excursions. Take in some of Indiana’s most picturesque scenery aboard the French Lick Scenic Railway. In addition to standard excursions, the railway offers themed rides throughout the summer. Want to feel like the star of an old Western movie? Hop aboard the “Wild West Hold-Up” and witness the River Renegades looting the train. Guests will enjoy traveling through the Hoosier National Forest and spending the day exploring French Lick. If you are looking for a little luxury on the rails, the Spirit of Jasper has you covered. Return to the Golden Age of travel by rail aboard their beautifully restored train. Take an excursion to French Lick or enjoy dinner and drinks during a “Ride and Dine” excursion. Or, if you are looking for a date-night idea, try the “Chocolate, Wine and Dine” option for guests 21 and over. Be sure to check out the Parlour Car, which features a modern take on a classic train with leather couches and a flat screen television. Opening in September of 2018, Nickel Plate Railroad will offer themed and general train rides for kids. Look for the Pumpkin Express in October and a Reindeer Ride in December, with more options to come. The train will run from Atlanta to Arcadia in 2018, and to Noblesville in 2019. Passengers on the Nickel Plate Express will be able to cruise through the Indiana countryside in style aboard groundbreaking Santa Fe Hi-level cars from the 1950s, which have two levels that resemble a double-decker bus. Visitors can also tour the on-site museum housed in the 150-year-old train depot in Arcadia, which will offer activities for kids to learn about trains and the history of Indiana – specifically how the Nickel Plate Railroad has shaped the Hamilton County community since the 1800s. 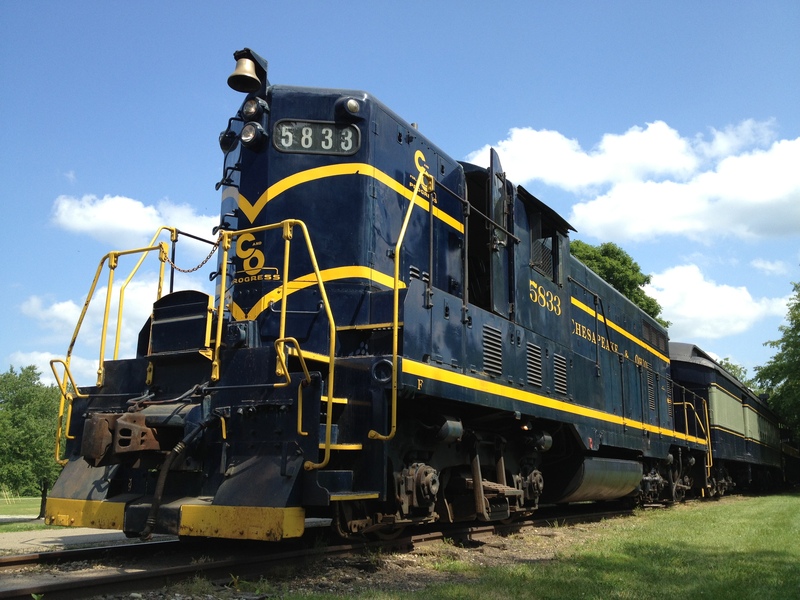 Operating since 1881, The Lebanon Mason Monroe Railroad carries passengers along scenic routes in southwestern Ohio. History buffs and train enthusiasts alike will enjoy this 14-mile stretch of track. In the summer months, children have the chance to ride the rails with beloved characters Curious George, Whyatt from SuperWhy! and Daniel Tiger. The fun continues with “Day Out With Thomas” excursions and Friday night pizza trains. If this railroad looks familiar, you might have seen its cameo in the 1994 movie Milk Money. Managed, operated and maintained completely by volunteers, the Hocking Valley Scenic Railway is a tribute to train enthusiasts. Passengers can choose to take in the scenery from both enclosed and open-air cars on the weekend train excursions. Families wanting a little drama should check out “Ohio’s Friendliest Train Robbery,” which will make passengers feel as if they returned to the days of outlaws and bandits. During its heyday, this railway stretched along 25 miles of coal country through Kentucky and Tennessee. Today, the railway seeks to preserve the history of the coal mining and timber industries. Passengers can enjoy the “K&T Special,” a three-hour ride that takes passengers into the Daniel Boone National Forest and Big South Fork National River & Recreation Area. Enjoy scenic vistas as the train descends 600 feet into the gorge before stopping at the Blue Heron Coal Mining Camp. Kentuck Railway Museum gives visitors a glimpse into the history of rail travel with their collection of railroad artifacts and memorabilia, all housed in a replica of the original New Haven Depot. They also offer regularly scheduled train excursions, as well as special events like “Day Out With Thomas” and “The Great Train Robbery.” Up for a little intrigue? Check out the “Mystery Theater and Train Ride,” which caters to adults and older children. Whether you are looking to take a step back in history, connect your kids with their favorite TV characters or simply enjoy the scenery while someone else does the driving, these eight Midwest railways offer a little something for everyone. All aboard!